Lie To Me JT Ellison Ellison’s latest stand-alone thriller is a non-stop who-done-it of epic proportions where the line between villain and victim is thin and at times nonexistent and lies are the ties that bind. With an edgy dialogue and a plot that’s full of surprises and will draw readers in and keep them guessing until the end she weaves her web of deceit, betrayal and death staring a duo of at times dueling husband and wife authors and a villain that’s an enigmatic real piece of work. Her duel timelines are the perfect way to tell the story and her dual settings of Tennessee and Paris add depth to this page turning chiller. The nail-biting storyline and the OMG finish will have readers staying up late to finish this unforgettable, best seller bound, must read. What started as just another day in the life of successful authors Ethan and Sutton Montclair becomes anything but when Ethan finds a note saying his wife Sutton has left, needs space and not to look for her. She didn’t take a thing not her purse, her phone or her laptop so he’s not really sure what to think or what to do. After consulting with several family friends he contacts the police to report her missing and suddenly a bad situation becomes worse when cracks in the foundation of their relationship become visible; motive for murder and fodder for the media. So now not only does Ethan have to wonder where Sutton went but also have a starring role as the villain in his real life mystery. Or perhaps he is the villain. 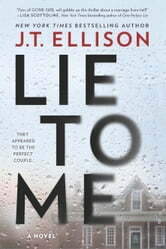 Full of twists and turns, lies and deception, and obstacles that threaten to destroy a relationship. When enough of the truth is revealed, the lies begin to unfold in a mysterious way. Riveting! Page-turner to the end. I am not sure why but my mind definitely checked out about a quarter of the way into the book. I read something else came back to it determined to finish it and I did. It was okay. My mind wasn't blown. But I am glad I finished it. Never would have guessed the ending. Want more of the story to discover what Sutton found out in the final pages.